Yep. I'm still scouring YouTube for Washington Wizards content, and going through hours of boring interviews trying to find something interesting. Being the #1 Lebron hater in the world, whenever his name pops up, I start to pay more attention. 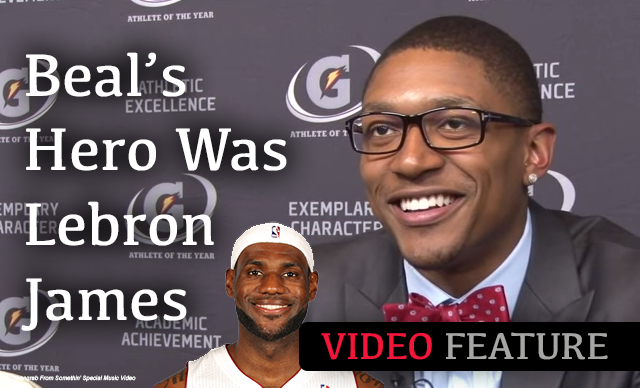 In this pretty typical interview with Bradley Beal he goes over a few things including some of his heroes growing up. The list starts with his older brother Brandon, then transfers to Allen Iverson, then...LEBRON! DAGGER! It's bad enough he is a St. Louis Cardinals fan! Check out this video interview by MaxPreps. "then eventually Lebron was kinda my hero..."
While Beal said Lebron WAS his hero, he didn't want to say too much now that they are enemies. "we still play him so I can't speak too highly of him"
The other interesting thing Beal said was when he was asked what he would be doing if he wasn't playing basketball. He answered "football", but then continued that if he didn't play football he would be a doctor (then said he is too old to do all that school...he is 21). "If I wasn't a football player, I'd probably be a doctor"